2. We send data securely either individually or in batches to the cloud solution to be "mail-merged" with the template document. 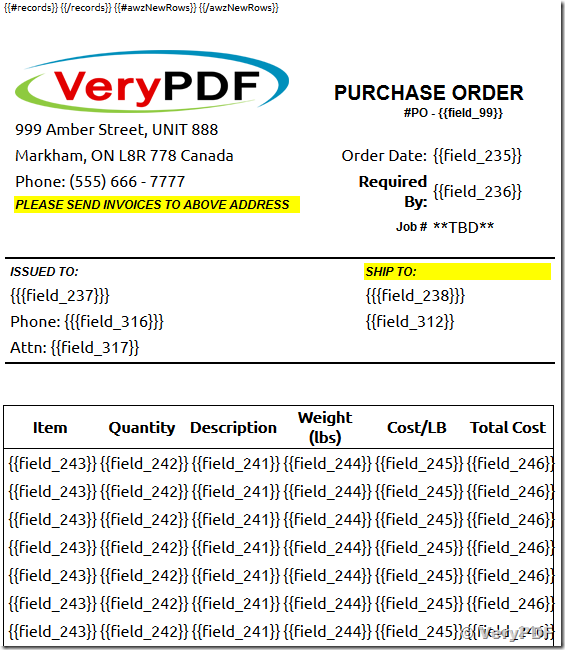 This PDF generation is vital to our business process. We need a robust and secure and API based solution and guaranteed uptime. Please let us know whether you would be able to provide this solution. Thanks for your message, we have done a similar work for a customer in the past, we are using HTML Invoice as a template, the customer does replace "keywords" in HTML template, and then call our "HTML to PDF Cloud API" to convert this web page to PDF file, everything is work perfectly. You can store HTML Template and Replace Keywords in HTML Template in your server, and pass the final HTML page to VeryPDF Cloud API, VeryPDF Cloud API will convert this web page to PDF file, you can then download converted PDF file back to your server, VeryPDF Cloud API will delete the temporary from ourself's server, everything can be done easily. If you encounter any problem, please feel free to let us know, we will assist you asap. How to specify font using HTML to PDF Converter Cloud API? How to Edit PDF Properties free online? How to fill from in scan image file online? This entry was posted in VeryPDF Cloud API and tagged cloud API, HTML to PDF, invoice to pdf, template to pdf, web page to PDF. Bookmark the permalink.